Providing patients with exceptional dental care to ensure you maintain optimal levels of oral health for years to come! Moore Family Dentistry has been providing exceptional quality dental care to patients in the Garner and 40/42 area since 2007. 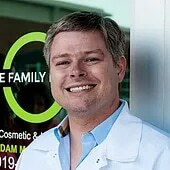 Dr. Adam Moore is a North Carolina native, growing up in the Knightdale area and attending both undergraduate and dental school at UNC-Chapel Hill. He is honored to be able to care for the oral health needs of the community where he has lived for most of his life. Dr. Moore always strives to provide you with the best possible dental experience. In order to achieve this goal, he focuses on providing unparalleled levels of personalized care. He personally handles every procedure, and he will always spend as much time as necessary with you to deliver the quality results you deserve. We are confident that Moore Family Dentistry can provide you with the best in dental care. We have the skills and background to address just about any dental issue you may need assistance with. Also, we work with and can file to most dental insurance plans. Our friendly, compassionate staff will ensure your visit will be stress-free!